I'm finally back after being pretty much stuck in bed for over a week! I won't bore you too much but I've had ongoing problems with lower back pain which has confined me to bed and made doing nails and blogging impossible. It's been incredibly frustrating, not to mention scary to all of a sudden not be able to do a thing for yourself. It's not fully better and I'm in quite a lot of pain even as I write this, but at least I'm out of bed! I created this triangle cut out look using w7 polishes. If you're in the UK you've probably heard of w7 before, it's a budget brand of great quality with a huge array of colours and finishes! The shimmery blue is w7 Seascape. I did the accent nail by painting on the triangle pattern with w7 black and a striper brush first, and then filling in some of the triangles using w7 Matt Green and Seascape. So easy to do, I might do a tutorial in the future! On to the swatches. Seascape is a shimmery cool blue. I used two coats. I encountered some air bubbles but that may have been to do with the intense heat we have going on here at the moment! 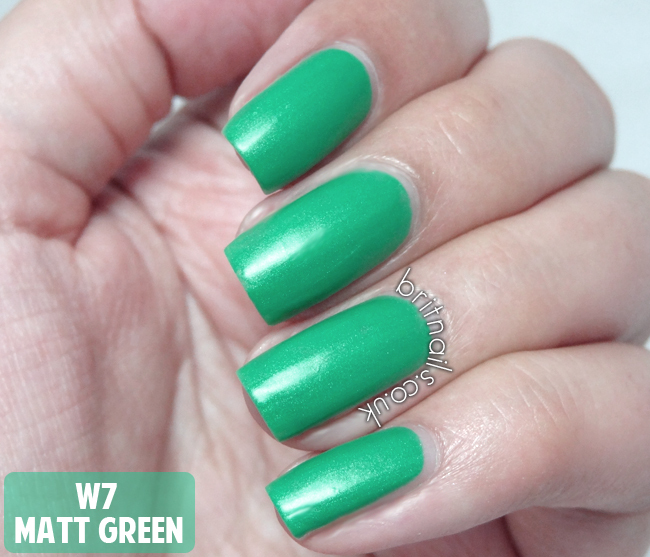 Matt Green is a kelly green matte with a bit of shimmer. I used 2 coats. As with most mattes I'd recommend thin coats as they tend to drag if you pile it on. Apologies for the strange hue of my hand here, I had to do a lot of colour adjustment to get it right, my camera insisted on turning the colour turquoise! You can find w7 in random places like Bodyworks, Home Bargains and even Argos! They're not sold in places like Boots and Superdrug as far as I know. 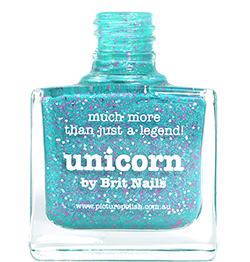 You can also find them on Fragrance Direct and Nail Polish Direct. I have been looking for a green shade for my nails, and I love this one! Stunning.